Six sample pages from Waiting for the Cars are previewed here. In the printed book, the left-hand page presents Alfred Hart’s stereo card in full color accompanied by the text. 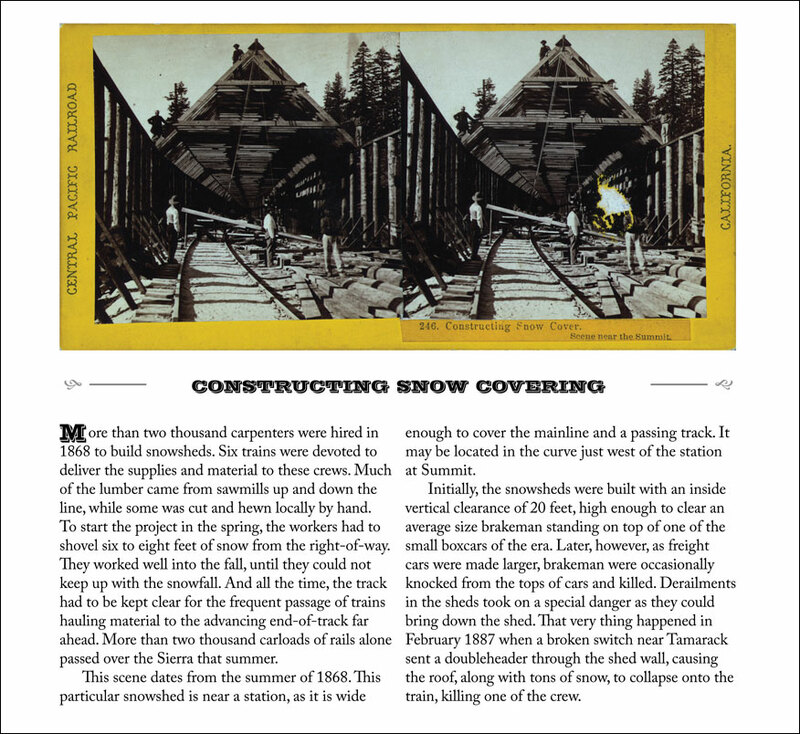 Each of these extended captions, by Nevada State Railroad Museum historian Wendell W. Huffman, describes the events depicted or places the scene in the larger context of the construction of America’s first transcontinental railroad. 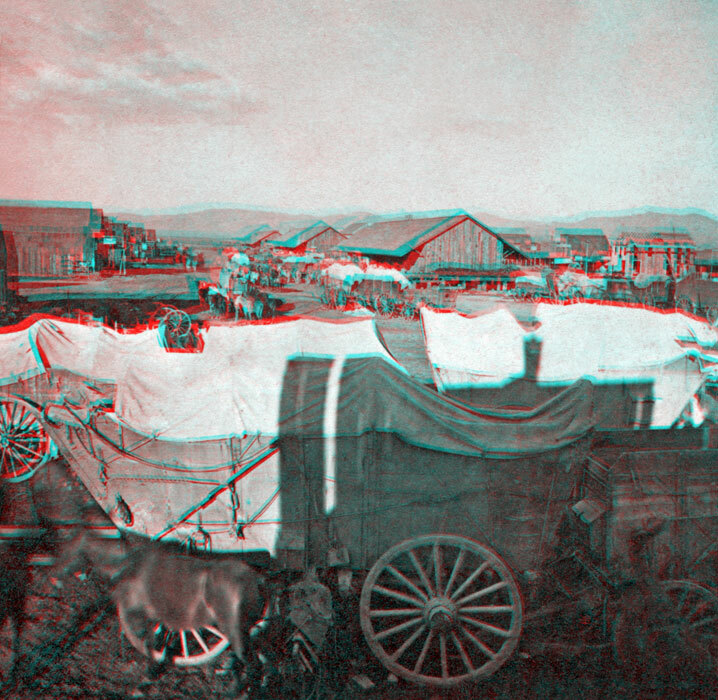 On the facing page is the 3D anaglyph derived from the two views of the stereo card. For this website preview, the six left-hand pages are presented exactly as found in the book. 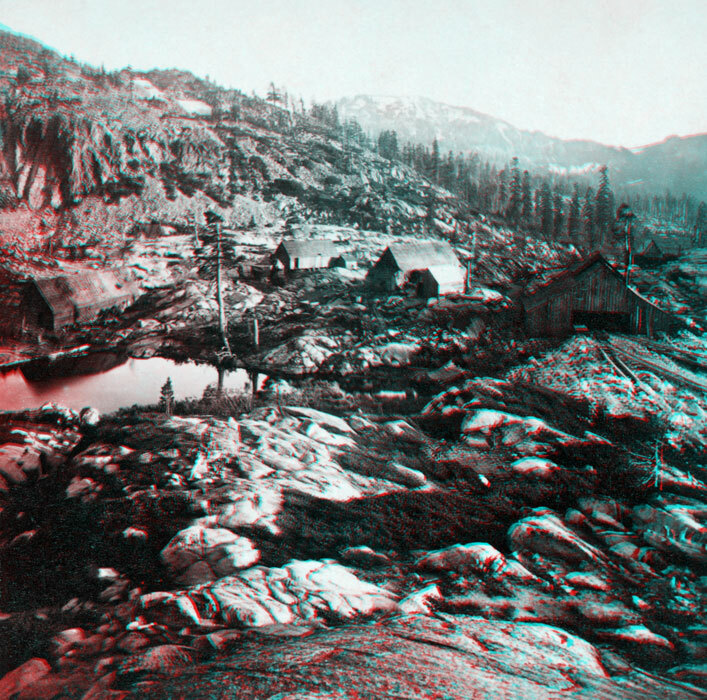 If you have a pair of 3D glasses, you can click on the stereo card to see the 3D anaglyph view in a floating window. 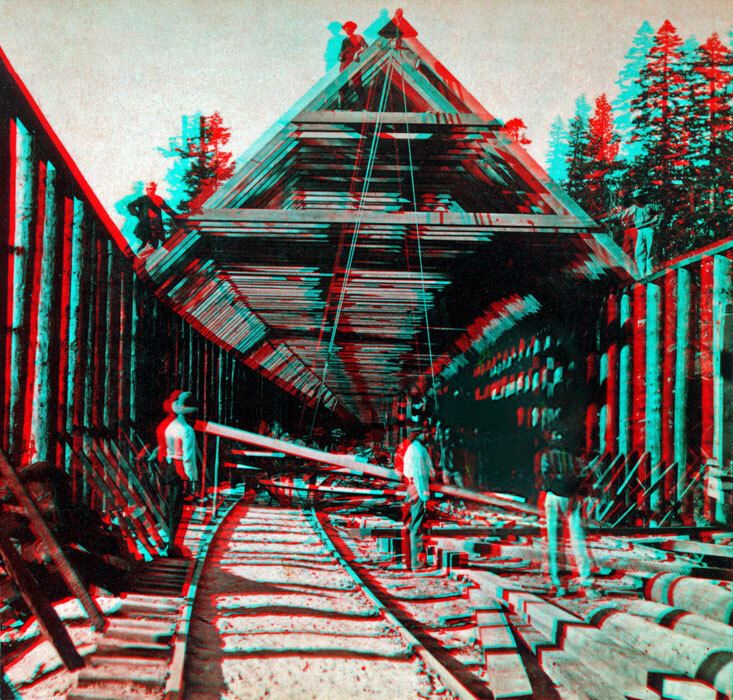 The red/cyan 3D glasses are required to see the 3D anaglyph images in Waiting for the Cars. Two pairs of these glasses are included with the book. 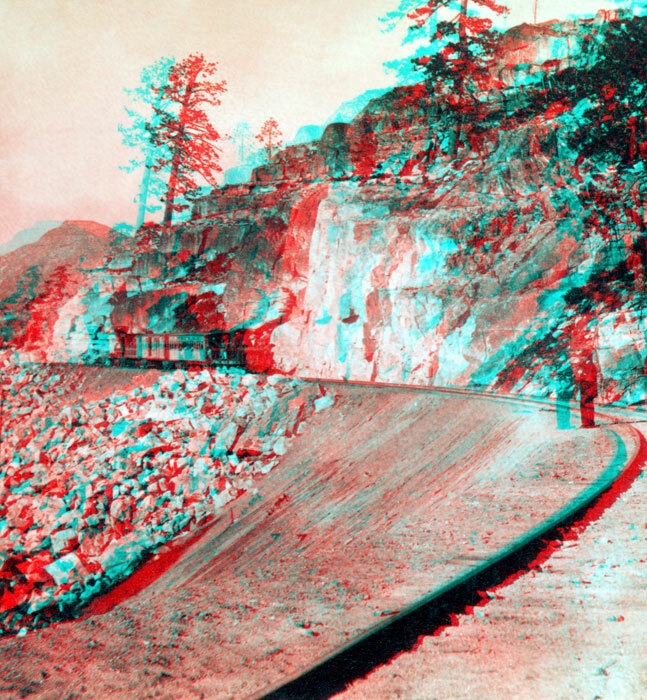 Information on ordering 3D glasses, including how to receive one free pair, may be found here. 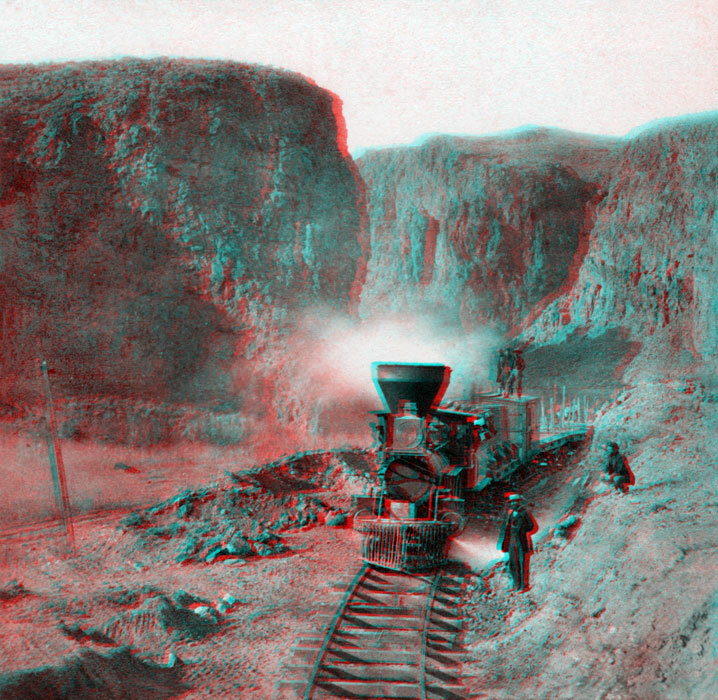 If you have your 3D glasses, click any of the stereo cards below to see the scene in 3D. 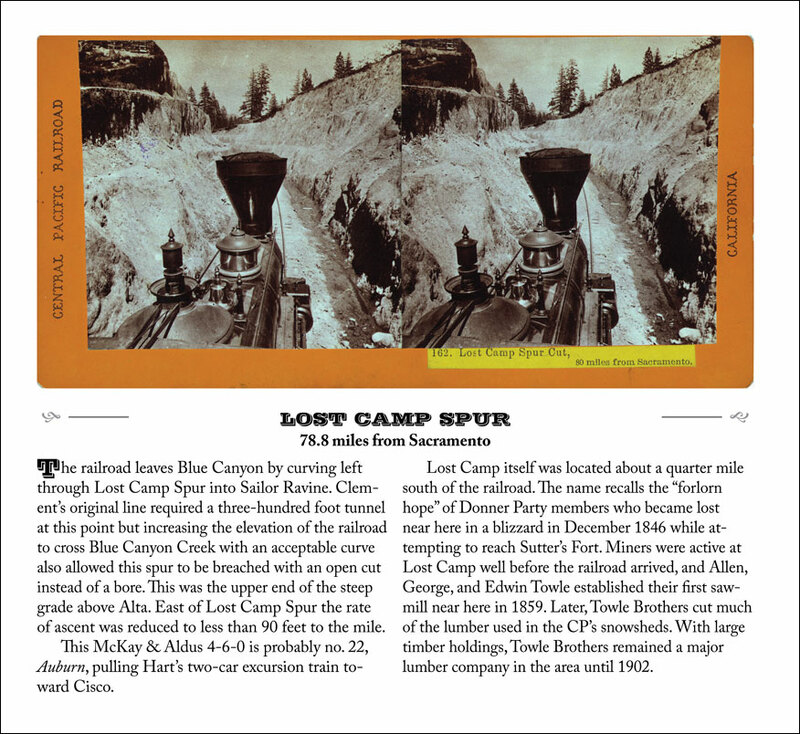 Lost Camp Spur, book pages 164-165. Click on the card to view in 3D. 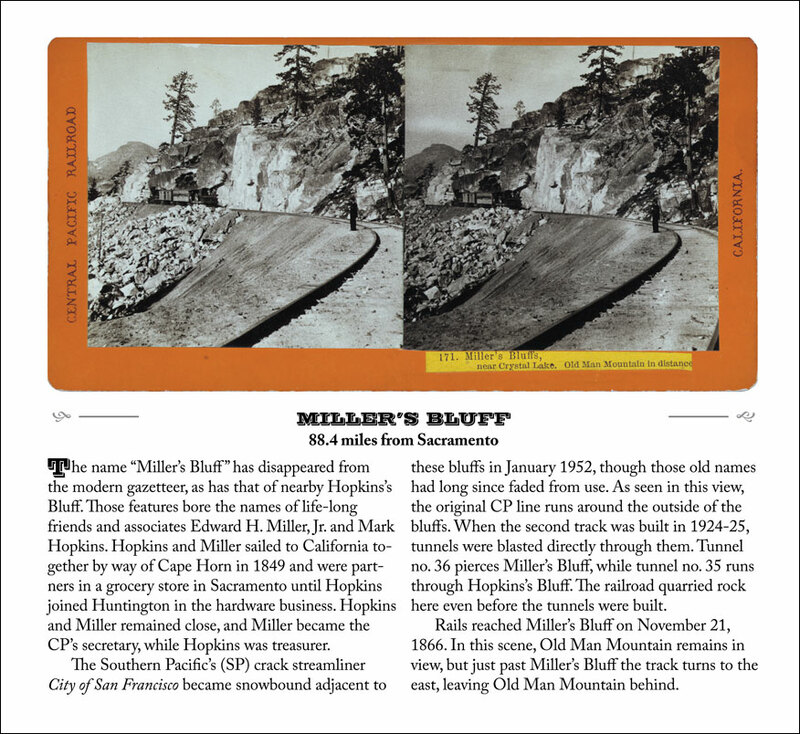 Miller’s Bluff, book pages 186-189. Click on the card to view in 3D. Constructing Snow Covering, book pages 230-231. Click on the card to view in 3D. 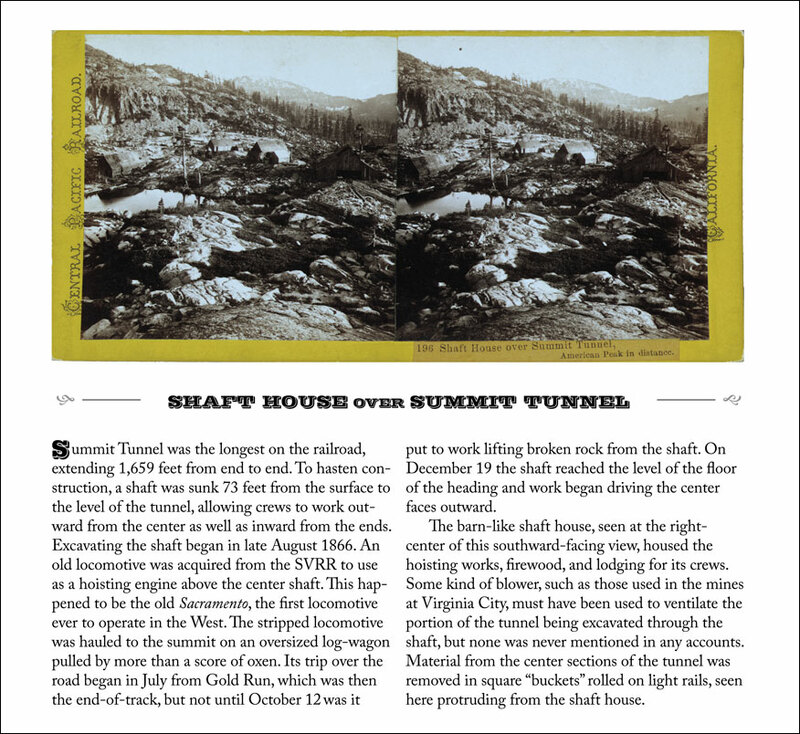 Shaft House Over Summit Tunnel, book pages 238-239. Click on the card to view in 3D. Click here for a virtual-reality view of the scene today. 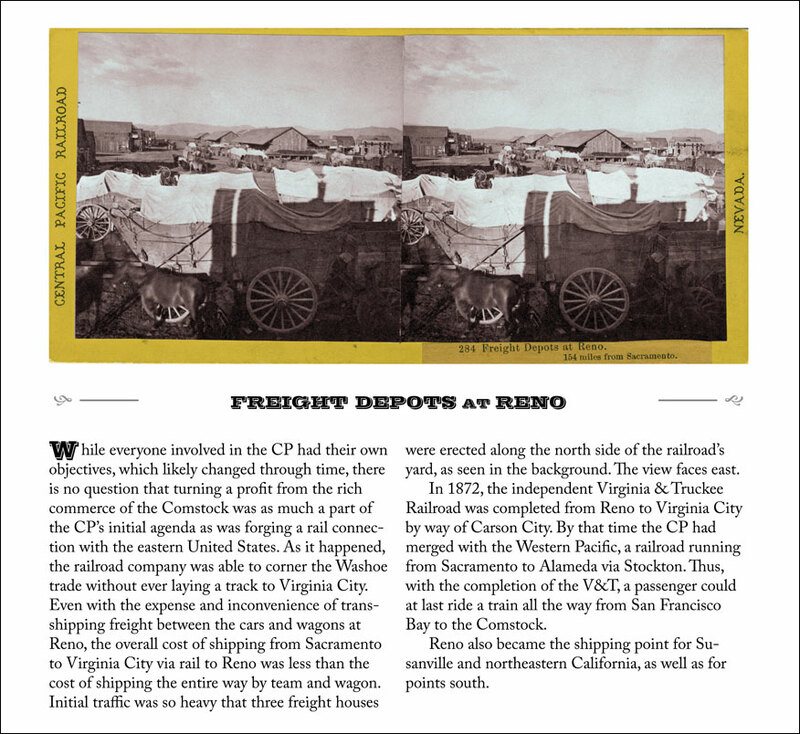 Freight Depots at Reno, book pages 320-321. Click on the card to view in 3D. 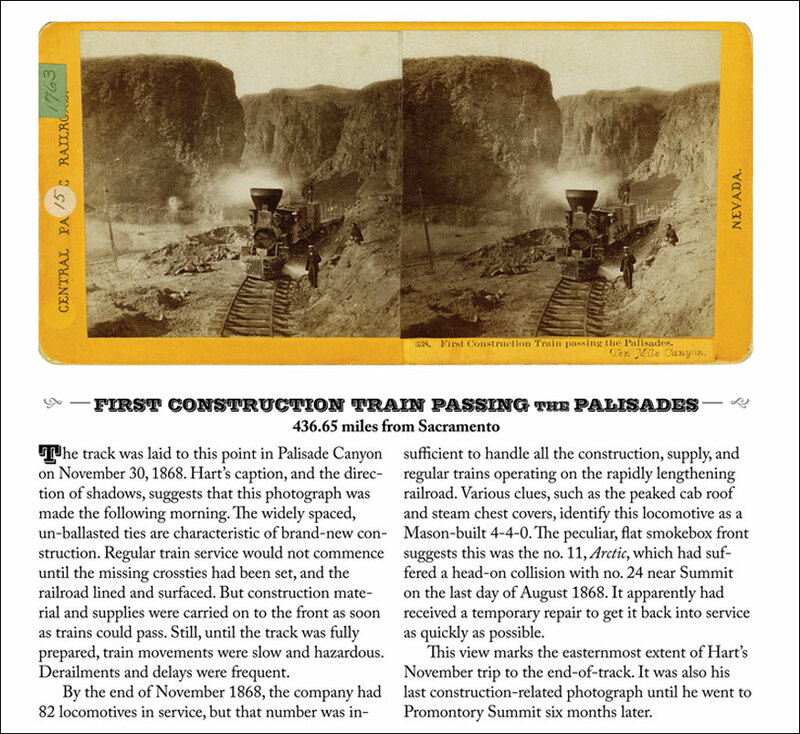 First Construction Train Passing the Palisades, book pages 406-407. Click on the card to view in 3D.